I'm sorry to say that we haven't posted anything here on our blog about Book Week yet - and now it's over for another year. It seems we were so busy preparing the activities and displays for the Libraries throughout the Shire we didn't get around to writing about it. I hope you had the opportunity to join us for one of our Book Week storytimes or at least saw some of the wonderful displays in all of our libraries, such as this one from Engadine (see more photos at flickr). 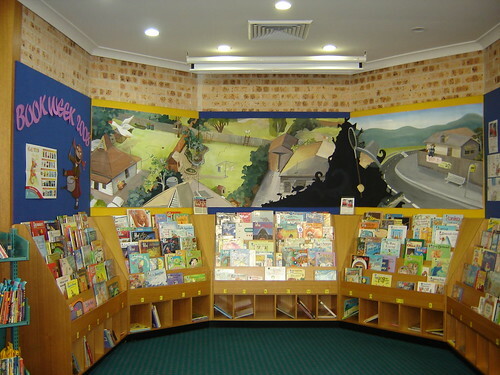 Book Week Display at Engadine Library, originally uploaded by Sutherland Shire Libraries. To all those who participated in Book Week parades at their school I hope your costumes looked fabulous and you all had a great day. You can visit the CBCA web site for honour books, the shortlist and winners from previous years. Did you know that Australia is one of only a handful of countries to compete in every modern summer Olympic Games? We very nearly lost our place in that exclusive group when the Commonwealth Government under Malcolm Fraser pushed for a boycott of the 1980 Moscow Olympic games. former swimming sensation, television reporter, radio host and actress Lisa Forrest has written a book about the controversy in the lead up to the Moscow games. It's called Boycott: Australia's controversial road to the 1980 Moscow Olympics and she recently gave a talk at Sutherland Library. If you missed the talk don't worry - we've recorded it. Lisa Forrest on her book - Boycott from Sutherland Shire Libraries on Vimeo. While you're watching the Beijing Olympics on the big screen at Sutherland Library check out some very interesting photographs from local artist Bruce Crowther. "Travelling around much of Australia I mainly photograph natural and man made landscape with view to an abstracted final image. I have been greatly influenced by some of the American photographers from the 1930s & 1940s and contemporary Australian painters." Bruce has exhibited in group shows in several regional galleries including Hazelhurst, Bathurst and Campbelltown as well as several galleries in Sydney and most recently in Tokyo at the Chuo City Museum. If you like what you see you can catch up with more of Bruce's work in November. He has a major solo show coming up at the Meyer Gallery in Darlinghurst, Sydney. It's a busy time for booklovers at the library. We've had author talks, the Good Read Guide is out, NSW Readers Week is coming up and to top it off it's awards time. The shortlist for the Prime Minister's Literary Awards has been announced, which should provide you with some very interesting fiction and non-fiction by Australian authors. Covers from LibraryThing where available. To celebrate Hearing Awareness Week 2008, 24th August – 30th August, Sutherland Shire Library Services is hosting information sessions and FREE hearing checks for Seniors and Veterans. Come along to Sutherland Library on Thursday 28th August or Caringbah Library on Wednesday 3rd September to have your hearing tested. A representative of Australian Hearing will give a talk about hearing loss commencing at 11am followed by FREE hearing checks! The key message this year is One in six Australians – it’s more common than you think and we are raising awareness of the dangers of over exposure to loud noise (especially loud music) so that people can enjoy the sound they love for longer. Hearing loss is a lot more common than most people think. A recent Australian study, Is Australia Listening? (warning - 3.5 Mb pdf), suggests as many as one in five over the age of 55 experience some degree of hearing impairment. As we get older the chances that we will have a hearing loss becomes greater. Take advantage of this chance to find out more and get your hearing screened at your library. If you missed out on our recent talk by Tony Park, author of Silent Predator, you're in luck! We recorded the talk and you can now watch the video on the web. Tony gave an interesting and well received talk about his books, the writing process and his travels in Africa, where all of his novels are set. Tony Park on Silent Predator from Sutherland Shire Libraries on Vimeo. Warning: this video is about 40 minutes long and is a big download. Enjoy!